Photo – Members of Bold Fit enjoy the outdoors. St. Stephen’s offers many opportunities for fellowship and service through participation in committees, ministry teams, and a variety of groups. To learn more about any of these opportunities, contact the church office. Finance Committee — The finance committee is responsible for monitoring St. Stephen’s financial health. The committee drafts the congregational budget, oversees expenditures and giving and advises the Ministry Board on financial matters. The committee meets monthly. Building and Grounds — As its name indicates, the committee maintains the St. Stephen’s building, facilities and church grounds. The committee researches necessary services and reports to the Ministry Board and coordinates appropriate and approved maintenance and improvement work. Worship and Fine Arts — the Worship and Fine Arts Ministry team strives to enhance the worship experience; address issues that could affect worship; explores and implements innovative ways to incorporate music and the arts in worship; and provides various community arts-based fellowship and outreach opportunities. The committee meets monthly. Technical — The Technical team oversees the use of technology to enhance the worship service and support congregational operations. These technologies include Sanctuary audio and visual systems and video recording of worship services. Technology team members also help support St. Stephen’s IT infrastructure. Seasoned Saints — Anyone can be a Seasoned Saint, but participants are usually senior members who enjoy gathering regularly for breakfast as well as entertainment and educational outings. Bold Café/Bold Fit — Bold Café and Bold Fit provide women of all ages the opportunity for fellowship, faith-based discussions and fitness. Bold Café meets monthly at member’s homes where they participate in biblically-supported, lifestyle-based conversations and enjoy food and fellowship. Bold Fit members meet monthly for area hikes followed by food and fellowship. 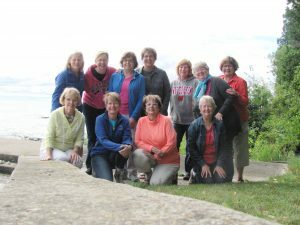 Members have also enjoyed God’s creation with trips to the Apostle Islands, Michigan’s Upper Peninsula and Door County.